On 6 August I dropped my daughter Georgie off at Nantes Railway Station to catch a train to Paris to see her new boyfriend before she goes home to England and then to Dubai to work as a teacher there for the next two years. Ted and I continued north to a campsite at Quiberon, Brittany. I took the picture on the beach here just before sunset as we walked along the seashore. Georgie came with us to France for the first week to give me a ‘soft landing’ as Ted and I took Rosie the camper van across the channel for the trip that Chris and I intended to make last August. We had to cancel it – with great regret – because Chris was, by then, too unwell to travel. In a sense, this trip is a homage to the dream we had of coming here together. So, here we are, me and the boy, discovering how to get along when we’re up close and personal 24/7. So far, the nights are fine (we both like to cuddle) and the walks along river bank and seashore (chucking and retrieving tennis balls from the water) are brilliant. He travels well but it was hot in the Loire, so coming further north to find cooler weather was the sensible thing to do. Ted is brilliant at many things, but he constantly pulls on the lead no matter what I do. This evening after a particularly torrid episode, I decided that something had to change and that since it clearly wasn’t going to be him it had to be me. Henceforth I told him (whilst he looked at me with those big sad eyes) I’m going to enjoy that fact that you are a sentient, semi-autonomous being who thinks he knows where he’s going instead of constantly being irritated that you don’t want to be the perfect show dog trotting adoringly by my side in the direction I want us to go. He ate a treat from my hand to show me he understood, at least I think that’s why he ate it. Chris had a natural gift for understanding doggydom. I’m a bit clunky but Teddy is a good teacher. I have read your posts with real delight. Maggie and I have many happy memories of Britanny in the days before children. In 1982 we camped on the Quiberon Peninsular with some friends. 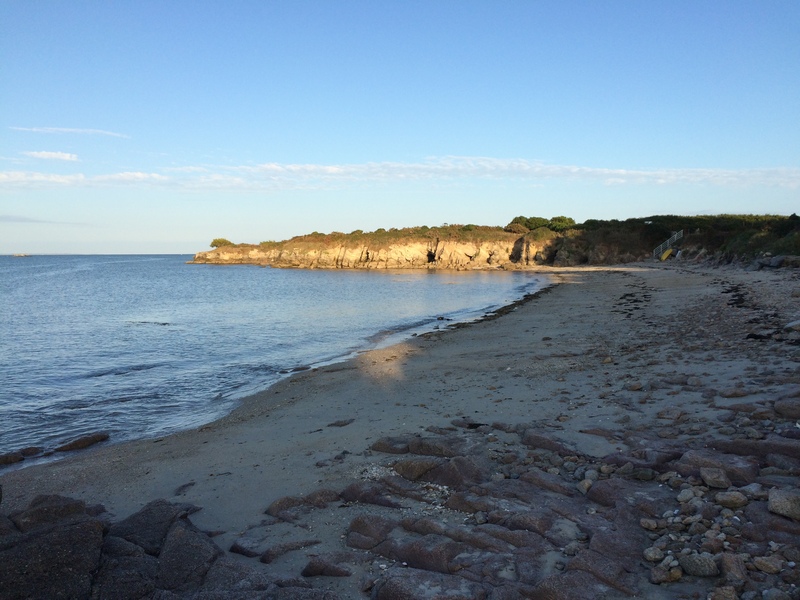 We stayed at a campsite called Do Mi Ci La Mer near Port Haliguen. I remember hiring bikes and cycling over the whole area – the Cote Sauvage, various beaches and restaurants, having Pastis and cacahuetes a l’Ancienne in a small bar in Quiberon town. One night a dutch couple made noisy love in a tent nearby. When they finished the whole campsite burst into spontaneous applause. Happy days!